River Valley’s Taylor Huck attempts a dig during the Lady Raiders victory over Rock Hill on Monday night in Gallia County. River Valley’s Lora Kinney attempts a serve during the Lady Raiders victory over Rock Hill on Monday night in Gallia County. BIDWELL, Ohio — A slow start, but a fantastic finish for the Silver and Black. 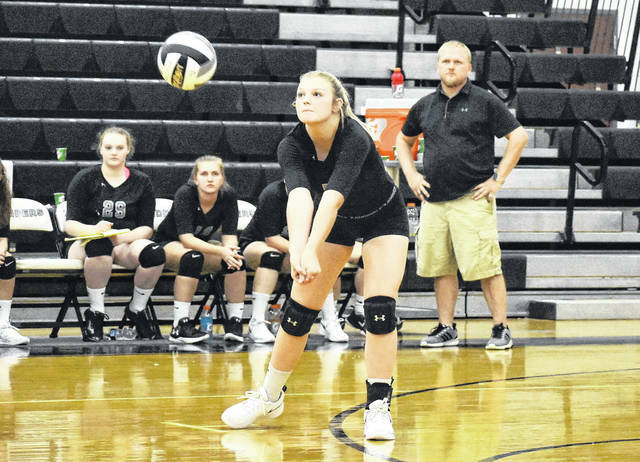 The River Valley volleyball team surrendered a two games to one advantage to visiting Rock Hill, but the Lady Raiders held their ground in the decisive fifth set to earn a 3-2 match victory, in Monday night’s non-conference contest in Gallia County. The win for the Lady Raiders also clinched a season sweep of the Redwomen, having earned a 3-0 match victory on Sep. 12 in Pedro. RVHS (9-10) charged to a 5-1 advantage in game one, but RHHS rallied to tie the contest at 6-all. The Redwomen never again trailed in the set, as they manufactured a 19-12 run en route to a 25-18 win. The second game was tightly contested, as the two squads exchanged the lead on five occasions before knotting the score at 11-apiece. River Valley’s Kelsey Brown, however, stepped to the service line and paced the hosts to a 10-0 scoring run to take a 21-11 advantage, en route to 25-19 victory. Following a 2-2 tie in the third set, RVHS outscored Rock Hill 23-11 the rest of the way, en route to a 25-13 win and 2-1 advantage in the match. The fourth game tightly contested as the visitors jumped to a 6-3 lead, but a 8-5 scoring run by the Silver and Black knotted the contest at 11-all. From there, the two squads engaged in a see-saw exchange for the lead before again tying the game at 18-apiece. Rock Hill, however, closed on a 7-0 scoring run, earning a 25-18 win to force a decisive fifth set. Following a 3-all tie in the finale, the game heavily favored River Valley as they outscored the visitors 12-3 to closed out a 15-6 win and 3-2 match victory. The Lady Raiders service attack was led by Lora Kinney with 14 points, while Brown followed with 13 service points, including one ace. Alexandria Wood posted 10 points, including one ace, as Mikenzi Pope was next with nine service points with one ace. Rachel Horner was next with seven points, including two aces, as Cierra Roberts and Kasey Birchfield concluded the RVHS service attack with four points apiece, respectively. The Rock Hill service attack was led by Shay Cox with 12 points, including three aces, as MacKenzie Hanshaw and Autumn Porter were next with 10 service points apiece, respectively. Porter also had two aces in the contest. Allyson Neal posted nine points, while Samantha Stamper followed with six service points. Katie Arthur was next with three points, as Whitney Howard concluded the RHHS service attack with two points. Following the triumph, second-year RVHS head coach Brent Smith was pleased with his teams performance — particularly the ability to make adjustments throughout the contest. “I think the girls kind of came in a bit lackadaisical,” Smith said. “With our previous win over Rock Hill, I think we kind of went through the motions in the first set. Rock Hill has improved greatly since we last played them and made it a challenge. I was really happy with the fourth set, I let some of the back row seniors have the opportunity to play front row and I was able to do that. In the fourth game we were trying to implement a few things and try something different with our rotation. The Lady Raiders returned to action on Tuesday for their final Tri Valley Conference Ohio Division contest of the season against the Lady Spartans in Bidwell, before a road date with non-conference foe Ironton St. Joseph on Thursday.